2005-10-04 Assigned to BAUSCH & LOMB INCORPORATED reassignment BAUSCH & LOMB INCORPORATED LICENSE AGREEMENT Assignors: CONTROL DELIVERY SYSTEMS, INC.
2007-11-16 Assigned to CREDIT SUISSE reassignment CREDIT SUISSE SECURITY AGREEMENT Assignors: B & L DOMESTIC HOLDINGS CORP., B&L CRL INC., B&L CRL PARTNERS L.P., B&L FINANCIAL HOLDINGS CORP., B&L MINORITY DUTCH HOLDINGS LLC, B&L SPAF INC., B&L VPLEX HOLDINGS, INC., BAUSCH & LOMB CHINA, INC., BAUSCH & LOMB INCORPORATED, BAUSCH & LOMB INTERNATIONAL INC., BAUSCH & LOMB REALTY CORPORATION, BAUSCH & LOMB SOUTH ASIA, INC., BAUSCH & LOMB TECHNOLOGY CORPORATION, IOLAB CORPORATION, RHC HOLDINGS, INC., SIGHT SAVERS, INC., WILMINGTON MANAGEMENT CORP., WILMINGTON PARTNERS L.P., WP PRISM, INC. The invention provides a device and method for treating and/or preventing raised intraocular pressure, such as that associated with glaucoma or the use of corticosteroids with adrenergic agents. The invention provides insertable sustained-release devices adapted to maintain a therapeutically effective concentration of one or more adrenergic agents for an extended period of time, and a method of use thereof. This application claims priority of co-pending provisional U.S. application 60/442,499, filed Jan. 24, 2003; 60/483,316, filed Jun. 26, 2003; 60/482,677, filed on Jun. 26, 2003; and 60/501,974 filed Sep. 11, 2003, the disclosures of each of which are incorporated by reference herein. Adrenergic agents have also proven useful in treating elevated intraocular pressure. Both β-adrenergic antagonists and α 1- and α2-adrenoceptor agonists are prescribed for individuals suffering from glaucoma, and also to control or prevent the elevations in intraocular pressure that frequently occur after ocular laser surgery. Typical α2-agonists (e.g., dipivefrin, brimonidine) reduce the tone of the sympathetic system at the ciliary process level, which leads to a decrease of aqueous humor synthesis. Another α-adrenoceptor agonist, apraclonidine, reportedly exhibits both α1 and α2-adrenoceptor activity, and at least one α1-adrenoceptor agonist (bunazosin) has been developed for the treatment of elevated intraocular pressure. Beta-adrenergic antagonists stimulate ciliary adenylyl cyclase activity. Examples of β-adrenergic antagonists that are effective in reducing intraocular pressure include timolol, betaxolol, levobetaxolol, levobunalol, carteolol, isoprenaline, fenoterol, metipranolol and clenbuterol. Both selective (β 2) and non-selective (β1 and β2) antagonists have been developed. FIG. 4 is a cross-sectional illustration of the embodiment illustrated in FIG. 2, taken at line  4-4. FIG. 5 is a cross-sectional illustration of a sustained release drug delivery device in accordance with the present invention, adapted for insertion into a lacrimal duct. In certain embodiments, the agent has a permeability coefficient in the outer layer of less than about 1×10 −10 cm/s. In other embodiments the permeability coefficient in the outer layer is greater than 1×10−10 cm/s, or even greater than 1×10−7 cm/s. In certain embodiments the permeability coefficient is at least 1×10−5 cm/s, or even at least 1×10−3 cm/s, or at least 1×10−2 cm/s. In certain of such embodiments, the release rite of the agent from the inner core may be reduced by the permeability of the second coating layer. In certain embodiments, the second coating layer is freely permeable to the agent. In certain embodiments, the second coating layer is semi-permeable to the agent. In certain embodiments, the agent has a permeability coefficient in the second coating layer of less than about 1×10 −10 cm/s. In other embodiments the permeability coefficient in the second coating layer is greater than 1×10−10 cm/s, or even greater than 1×10−7 cm/s. In certain embodiments the permeability coefficient is at least 1×10−5 cm/s, or even at least 1×10−3 cm/s, or at least 1×10−2 cm/s in the second layer. Turning now to the drawing figures, FIG. 1 illustrates a longitudinal cross-sectional view of a drug delivery device  100 in accordance with the present invention. Device 100 includes an outer layer 110, an inner tube 112, a reservoir or drug core 114, and an inner cap 116. Outer layer 110 is preferably a permeable layer, that is, the outer layer is permeable to the adrenergic agent(s) contained within reservoir 114. Cap 116 is positioned at one end of tube 112. Cap 116 is preferably formed of a substantially impermeable material, that is, the cap is not permeable to the adrenergic agent(s) contained within reservoir 114. Cap 116 is joined at end 118, 120 of inner tube 112, so that the cap and the inner tube together close off a space in the tube in which reservoir 114 is positioned. Inner tube 112 and cap 116 can be formed separately and assembled together, or the inner tube and the cap can be formed as a single, integral, monolithic element. Outer layer  110 at least partially, and preferably completely, surrounds both tube 112 and cap 116, as illustrated in FIG. 1. While it is sufficient for outer layer 110 to only partially cover tube 112 and cap 116, and in particular the opposite ends of device 100, the outer layer is preferably formed to completely envelop both the tube and cap to provide structural integrity to the device, and to facilitate further manufacturing and handling because the device is less prone to break and fall apart. While FIG. 1 illustrates cap 116 having an outer diameter the same as the outer diameter of inner tube 112, the cap can be sized somewhat smaller or larger than the outer diameter of the inner tube while remaining within the spirit and scope of such embodiments of the present invention. Reservoir  114 is positioned inside inner tube 112, as described above. A first end 122 abuts against cap 116, and is effectively sealed by the cap against the diffusion of drug through the first end. On the end of reservoir 114 opposite cap 116, the reservoir is preferably in direct contact with outer layer 110. As will be readily appreciated by one of ordinary skill in the art, as carbonic anhydrase inhibitor(s) is released from a non-fluid core contained within reservoir 114, the core may shrink or otherwise change shape, and therefore may not fully or directly contact outer layer 110 at the end of the reservoir opposite cap 116. As outer layer 110 is permeable to the adrenergic agent(s) in reservoir 114, the drug is free to diffuse out of the reservoir along a first flow path 124 into portions of outer layer 110 immediately adjacent to the open end of the reservoir. From outer layer 110, the drug is free to diffuse along flow paths 126 out of the outer layer and into the tissue or other anatomical structure in which device 100 is inserted. Optionally, holes can be formed through inner layer 112 to add additional flow paths 126 between reservoir 114 and permeable outer layer 110. FIG. 1 illustrates only the positions of the several components of device  100 relative to one another, and for ease of illustration shows outer layer 110 and inner tube 112 as having approximately the same wall thickness. The thickness of the layer and wall are exaggerated for ease of illustration, and are not drawn to scale. While the walls of outer layer 110 and inner tube 112 may be of approximately the same thickness, the inner tube's wall thickness can be significantly thinner or thicker than that of the outer layer within the spirit and scope of the present invention. Additionally, device 100 is preferably cylindrical in shape, for which a transverse cross-section (not illustrated) will show a circular cross-section of the device. While it is preferred to manufacture device 100 as a cylinder with circular cross-sections, it is also within the scope of the invention to provide cap 116, adrenergic agent(s) reservoir 114, inner tube 112, and/or outer layer 110 with other cross-sections, such as ovals, ellipses, rectangles, including squares, triangles, as well as any other regular polygon or irregular shapes. Furthermore, device 100 can optionally further include a second cap (not illustrated) on the end opposite cap 116; such a second cap could be used to facilitate handling of the device during fabrication, and would include at least one through hole for allowing adrenergic agent(s) from reservoir 114 to flow from the device. Alternatively, the second cap may be formed of a permeable material. Where the device is adapted for insertion into the lacrimal canaliculus, inner tube  112, 212, or 312 will be sized to fit within the lacrimal canaliculus, and will preferably be formed with a collarette, sized to rest on the exterior of the lacrimal punctum, at the end opposite cap 116, 242, or 316. It will be appreciated that permeable outer layer 110, 210, or 310 need not cover the entire device in this embodiment, as drug release will preferably-be limited to the region of the device intended to remain external to the canaliculus. FIG. 2 illustrates a device  200 in accordance with a second example of such embodiments of the present invention. Device 200 includes an impermeable inner tube 212, a adrenergic agent(s) drug core 214, and a permeable plug 216. Device 200 optionally and preferably includes an impermeable outer layer 210, which adds mechanical integrity and dimensional stability to the device, and aids in manufacturing and handling the device. As illustrated in FIG. 2, drug core 214 is positioned in the interior of inner tube 212, in a fashion similar to core 114 and inner tube 112 described above. Plug 216 is positioned at one end of inner tube 212, and is joined to the inner tube at end 218, 220 of the inner tube. While plug 216 may extend radially beyond inner tube 212, as illustrated in FIG. 2, the plug may alternatively have substantially the same radial extent as, or a slightly smaller radial extent than, the inner tube, while remaining within the scope of the invention. As plug 216 is permeable to the adrenergic agent(s) contained in the reservoir, the adrenergic agent(s) is free to diffuse through the plug from the reservoir. Plug 216 therefore must have a radial extent that is at least as large as the radial extent of reservoir 214, so that the primary diffusion pathway 230 out of the reservoir is through the plug. On the end of inner tube 212 opposite plug 216, the inner tube is closed off or sealed only by outer layer 210, as described below. Optionally, a substantially impermeable cap 242, which can take the form of a disc, is positioned at the end of reservoir opposite plug 216. When provided, cap 242 and inner tube 212 can be formed separately and assembled together, or the inner tube and the cap can be formed as a single, integral, monolithic element. Outer tube or layer  210, when provided, at least partially, and preferably completely, surrounds or envelopes inner tube 212, adrenergic agent(s) reservoir 214, plug 216, and optional cap 242, except for an area immediately adjacent to the plug which defines a port 224. Port 224 is, in preferred embodiments, a hole or blind bore which leads to plug 216 from the exterior of the device. As outer layer 210 is formed of a material that is impermeable to the adrenergic agent(s) in reservoir 214, the ends of inner tube 212 and reservoir 214 opposite plug 216 are effectively sealed off, and do not include a diffusion pathway for the adrenergic agent(s) to flow from the reservoir. According to a preferred embodiment, port 224 is formed immediately adjacent to plug 216, on an end 238 of the plug opposite end 222 of reservoir 214. Plug 216 and port 224 therefore include diffusion pathways 230, 232, through the plug and out of device 200, respectively. While port  224 in the embodiment illustrated in FIG. 2 has a radial extent that is approximately the same as inner tube 212, the port can be sized to be larger or smaller, as will be readily apparent to one of ordinary skill in the art. For example, instead of forming port 224 radially between portions 228, 230 of outer layer 210, these portions 228, 230 can be removed up to line 226, to increase the area of port 224. Port 224 can be further enlarged, as by forming outer layer 210 to extend to cover, and therefore seal, only a portion or none of the radial exterior surface 240 of plug 216, thereby increasing the total surface area of port 224 to include a portion or all of the outer surface area of the plug. In accordance with yet another embodiment of the invention, port  224 of device 200 can be formed immediately adjacent to radial external surface 240 of plug 216, in addition to or instead of being formed immediately adjacent to end 238 of the plug. As illustrated in FIG. 4, port 224 can include portions 234, 236, which extend radially away from plug 216. These portions can include large, continuous, circumferential and/or longitudinal portions 236 of plug 216 which are not enveloped by outer layer 210, illustrated in the bottom half of FIG. 4, and/or can include numerous smaller, circumferentially spaced apart portions 234, which are illustrated in the top half of FIG. 4. Advantageously, providing port 224 immediately adjacent to radial external surface 240 of plug 216, as numerous, smaller openings 234 to the plug, allows numerous alternative pathways for the adrenergic agent(s) to diffuse out of device 200 in the event of a blockage of portions of the port. Larger openings 236, however, benefit from a relative ease in manufacturing, because only a single area of plug 216 need be exposed to form port 224. According to yet another embodiment of the invention, plug  216 is formed of a substantially impermeable material and outer layer 210 is formed of a permeable material. A hole or holes are formed, e.g., by drilling, through one or more of inner layer 212, cap 242, and plug 216, which permit adrenergic agent(s) to be released from reservoir 214 through outer layer 210. According to another embodiment, plug 216 is eliminated as a separate member, and permeable outer layer 210 completely envelopes inner tube 212 and cap 242 (if provided). Thus, the diffusion pathways 230, 232 are through outer layer 210, and no separate port, such as port 224, is necessary. By completely enveloping the other structures with outer layer or tube 210, the system 200 is provided with further dimensional stability. Further optionally, plug 216 can be retained, and outer layer 210 can envelop the plug as well. According to yet another such embodiment of the present invention, inner tube  212 is formed of a permeable material, outer layer 210 is formed of an impermeable material, and cap 242 is formed of either a permeable or an impermeable material. Optionally, cap 242 can be eliminated. As described above, as outer layer 210 is impermeable to the adrenergic agent(s) in reservoir 214, plug 216, port 224, and optional ports 234, 236, are the only pathways for passage of the adrenergic agent(s) out of device 200. The shape of device  200 can be, in a manner similar to that described above with respect to device 100, any of a large number of shapes and geometries. Furthermore, both device 100 and device 200 can include more than one reservoir 114, 214, included in more than one inner tube 112, 212, respectively, which multiple reservoirs can include different adrenergic agents, or ocular medicaments such as a miotic agent in addition to a adrenergic agent, for diffusion out of the device. In device 200, multiple reservoirs 214 can be positioned to abut against only a single plug 216, or each reservoir 214 can have a dedicated plug for that reservoir. Such multiple reservoirs can be enveloped in a single outer layer 110, 210, as will be readily appreciated by one of ordinary skill in the art. Turning now to FIG. 3, FIG. 3 illustrates a device  300 in accordance with a third exemplary embodiment of the invention. Device 300 includes a permeable outer layer 310, a substantially impermeable inner tube 312, a reservoir 314, a substantially impermeable cap 316, and a permeable plug 318. A port 320 communicates plug 318 with the exterior of the device, as described above with respect to port 224 and plug 216. Inner tube 312 and cap 316 can be formed separately and assembled together, or the inner tube and the cap can be formed as a single, integral, monolithic element. The provision of permeable outer layer 310 allows the adrenergic agent(s) in reservoir or drug core 314 to flow through the outer layer in addition to port 320, and thus assists in raising the overall delivery rate. Of course, as will be readily appreciated by one of ordinary skill in the art, the permeability of plug 318 is the primary regulator of the drug delivery rate, and is accordingly selected. Additionally, the material out of which outer layer 310 is formed can be specifically chosen for its ability to adhere to the underlying structures, cap 316, tube 312, and plug 318, and to hold the entire structure together. Optionally, a hole or holes 322 can be provided through inner tube 312 to increase the flow rate of adrenergic agent(s) from reservoir 314. In another embodiment, only a single outer layer need be used. FIG. 6 illustrates such an embodiment, wherein the sustained release device (product  612) includes an outer layer or skin 614 and an inner core 616. Materials that may be suitable for fabricating devices  100, 200, 300, and 712 include naturally occurring or synthetic materials that are biologically compatible with body fluids and/or eye tissues, and essentially insoluble in body fluids with which the material will come in contact. The use of rapidly dissolving materials or materials highly soluble in eye fluids are to be avoided since dissolution of the outer layers 110, 210, 310 would affect the constancy of the drug release, as well as the capability of the system to remain in place for a prolonged period of time. Specifically, outer layer  210 of device 200 may be made of any of the above-listed polymers or any other polymer that is biologically compatible with body fluids and eye tissues, essentially insoluble in body fluids with which the material will come in contact, and permeable to the passage of the adrenergic agent(s). When inner tube  112, 212, 312 is selected to be substantially impermeable, as described above, to the passage of the adrenergic agent(s) from the inner core or reservoir out to adjacent portions of the device, the purpose is to block the passage of the adrenergic agent(s) through those portions of the device, and thus limit the release of the adrenergic agent(s) from the device to selected regions of the outer layer and plugs 216 and 318. The composition of outer layer  110, e.g., the polymer, is preferably selected so as to allow the above-described controlled release. The preferred composition of outer layer 110 and plug 216 will vary depending on such factors as the identity of the adrenergic agent(s), the desired rate of release, and the mode of implantation or insertion. The identity of the active agent is important since it determines the desired therapeutic concentration, and because the physico-chemical properties of the molecule are among the factors that affect the rate of release of the agent into and through the outer layer 110 and plug 216. Caps  116, 242, 316 are substantially impermeable to the passage of the adrenergic agent(s) and may cover a portion of the inner tube not covered by the outer layer. The physical properties of the material, preferably a polymer, used for the caps can be selected based on their ability to withstand subsequent processing steps (such as heat curing) without suffering deformation of the device. The material, e.g., polymer, for substantially impermeable outer layer 210 can be selected based on the ease of coating inner tube 212. Cap 116 and inner tubes 112, 212, 312 can independently be formed of any of a number of materials, including PTFE, polycarbonate, polymethyl methacrylate, polyethylene alcohol, high grades of ethylene vinyl acetate (9% vinyl, content), and polyvinyl alcohol (PVA). Plugs 216, 318 can be formed of any of a number of materials, including cross-linked PVA, as described below. Outer layers  110, 210, 310, and plugs 216, 318 of the device must be biologically compatible with body fluids and tissues, essentially insoluble in body fluids with which the material will come in contact, and outer layer 110 and plugs 216, 318 must be permeable to the passage of the adrenergic agent(s). The adrenergic agent(s) diffuses in the direction of lower chemical potential, i.e., toward the exterior surface of the device. At the exterior surface of the device, equilibrium is again established. When the conditions on both sides of outer layer  110 or plugs 216, 318 are maintained constant, a steady state flux of the adrenergic agent(s) will be established in accordance with Fick's Law of Diffusion. The rate of passage of the drug through the material by diffusion is generally dependent on the solubility of the drug therein, as well as on the thickness of the wall. This means that selection of appropriate materials for fabricating outer layer 110 and plug 216 will be dependent on the particular adrenergic agent(s) to be used. Exemplary microporous materials suitable for use as outer layer  110 and plugs 216, 318, for instance, are described in U.S. Pat. No. 4,014,335, which is incorporated herein by reference in its entirety. These materials include but are not limited to cross-linked polyvinyl alcohol, polyolefins or polyvinyl chlorides or cross-linked gelatins; regenerated, insoluble, non-erodable cellulose, acylated cellulose, esterified celluloses, cellulose acetate propionate, cellulose acetate butyrate, cellulose acetate phthalate, cellulose acetate diethyl-aminoacetate; polyurethanes, polycarbonates, and microporous polymers formed by co-precipitation of a polycation and a polyanion modified insoluble collagen. Cross-linked polyvinyl alcohol is preferred for both outer layer 110 and plugs 216, 318. Preferred impermeable portions of the devices, e.g., cap 116 and inner tubes 112, 212, are formed of PTFE or ethyl vinyl alcohol. When such devices are prepared for insertion within the vitreous of the eye, it is preferred that the device does not exceed about 7 millimeters in any direction. Thus, the cylindrical devices illustrated in FIGS. 1 and 2 would preferably not exceed 7 millimeters in height or 3 millimeters in diameter, more preferably less than 1 mm in diameter and more preferably less than 0.5 mm in diameter. The preferred thickness of the walls of inner tubes  112, 212 ranges between about 0.01 mm and about 1.0 mm. The preferred thickness of the wall of outer layer 110 ranges between about 0.01 mm and about 1.0 mm. The preferred thickness of the wall of outer layer 210 ranges between about 0.01 mm and 1.0 mm. The inner drug-containing core of the various embodiments of the present invention preferably contains a high proportion of adrenergic agent(s), so as to maximize the amount of drug contained in the device and maximize the duration of drug release. Accordingly, in some embodiments, the drug core may consist entirely of one or more adrenergic agents in crystalline or amorphous form. wherein the first and additional coatings are disposed about the inner drug core so as to produce, when implanted, a substantially constant rate of release of the adrenergic agent from the device. wherein the impermeable coating has sufficient dimensional stability to be filled with an adrenergic agent core without changing its shape. 3. The device of claim 1, wherein the impermeable coating has sufficient dimensional stability to be filled with an adrenergic agent core without changing its shape. 4. A method for administering an adrenergic agent to the ciliary body of an eye, the method comprising implanting a sustained-release device in or adjacent to the eye, whereby the device delivers the adrenergic agent to the ciliary body of the eye, wherein the adrenergic agent concentration in the ciliary body is maintained at a therapeutically effective concentration for a period of at least 30 days. 5. A method for administering an adrenergic agent to the ciliary body of an eye, the method comprising implanting a sustained-release device according to any one of claims 1-3 or 14 in or adjacent to the eye, whereby the device delivers the adrenergic agent to the ciliary body of the eye, wherein the adrenergic agent concentration in the ciliary body is maintained at a therapeutically effective concentration for a period of at least 30 days. 6. The method of claim 4, wherein the adrenergic agent concentration in the ciliary body is maintained at a therapeutically effective concentration for a period of at least 180 days. 7. The method of claim 5, wherein the adrenergic agent concentration in the ciliary body is maintained at a therapeutically effective concentration for a period of at least 180 days. 8. The method of claim 4, wherein the adrenergic agent concentration in the ciliary body is maintained at a therapeutically effective concentration for a period of at least 360 days. 9. The method of claim 5, wherein the adrenergic agent concentration in the ciliary body is maintained at a therapeutically effective concentration for a period of at least 360 days. 10. The device according to any one of claims 1-4, 6, and 8, wherein the adrenergic agent is selected from the group consisting of brimonidine, aapraclonidine, bunazosin, timolol, betaxolol, levobetaxolol, levobunalol, carteolol, isoprenaline, fenoterol, metipranolol, clenbuterol, epinephrine, and dipivefrin. 11. The method according to claim 5, wherein the adrenergic agent is selected from the group consisting of brimonidine, aapraclonidine, bunazosin, timolol, betaxolol, levobetaxolol, levobunalol, carteolol, isoprenaline, fenoterol, metipranolol, clenbuterol, epinephrine, and dipivefrin. 12. The method according to claim 7, wherein the adrenergic agent is selected from the group consisting of brimonidine, aapraclonidine, bunazosin, timolol, betaxolol, levobetaxolol, levobunalol, carteolol, isoprenaline, fenoterol, metipranolol, clenbuterol, epinephrine, and dipivefrin. 13. 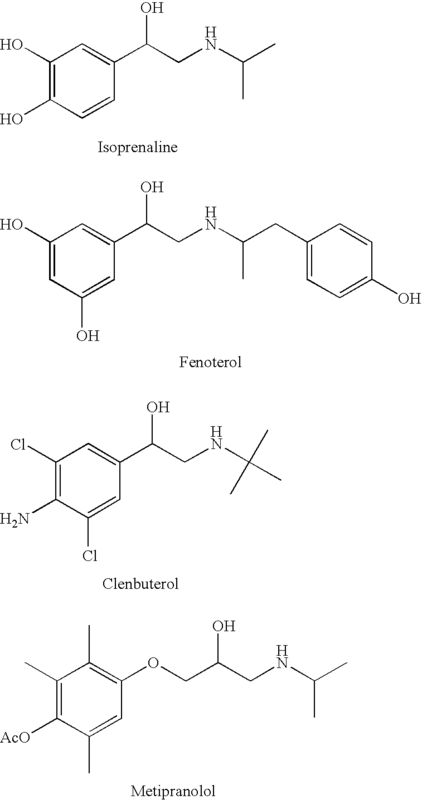 The method according to claim 9, wherein the adrenergic agent is selected from the group consisting of brimonidine, aapraclonidine, bunazosin, timolol, betaxolol, levobetaxolol, levobunalol, carteolol, isoprenaline, fenoterol, metipranolol, clenbuterol, epinephrine, and dipivefrin. wherein the coating is disposed about the inner drug core so as to produce, when inserted a substantially constant rate of release of the adrenergic agent(s) from the device. 15. The sustained release drug delivery device of claim 14, wherein the inner drug core is admixed with a polymer matrix. 16. The sustained release drug delivery device of claim 15, wherein the polymer matrix is bioerodible. 17. The sustained release drug delivery device of claim 14, wherein the device is formed by co-extruding the inner drug core and the coating layer. wherein the coating is disposed about the inner drug core so as to produce, when inserted, a substantially constant rate of release of the at least one adrenergic agent from the device. 19. The sustained release drug delivery device of claim 18, wherein the inner drug core is admixed with a polymer matrix. 20. The sustained release drug delivery device of claim 19, wherein the polymer matrix is bioerodible. 21. The sustained release drug delivery device of claim 20, wherein the device is formed by co-extruding the inner drug core and the coating layer. ES2256859T5 (en) 2009-04-01 biodegradable implants formulated for controlled, sustained release of drugs. ES2233981T3 (en) 2005-06-16 controlled implantable device for administering drugs directly to an internal body part release.